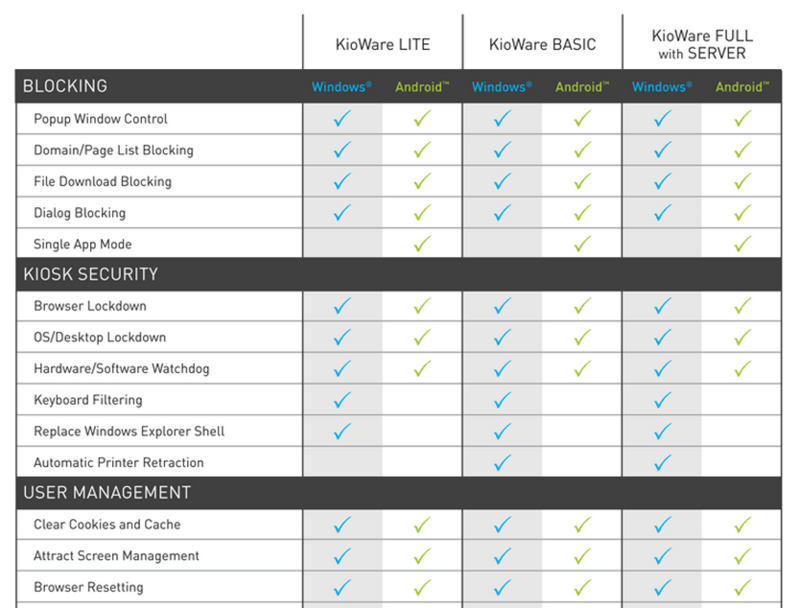 The new KioWare Software Comparison Chart now includes the KioWare for Android product line, allowing users to better determine which of KioWare's robust product line best suits their needs. Not sure which operating system to choose? The comparison chart visually displays both Windows and Android product features. In addition, the chart makes it simple to view the feature you are looking for to better determine if you need KioWare Lite, KioWare Basic, or KioWare Full. As illustrated in the chart, KioWare Lite serves to lockdown your browser, turning your application or website into a self service tool. The next product up the line, KioWare Basic, allows users to integrate with external devices. The most robust product, KioWare Full with Server, is clearly the remote management, data, kiosk health, content management and enterprise solution for larger deployments or more robust tracking and analytics. The updated comparison chart is not the only addition to the KioWare website. New content includes: the new user video, "Why your kiosks need kiosk software", a brief FAQ for new users, detailed information about healthcare kiosk best practices, a list of human resources kiosk uses, and an overview of KioWare's remote server management features and functions. Learn more about KioWare's lockdown software solution and how it can keep your devices, users, and data safe. Sign up for notifications when we update our news section using this IFTTT Recipe.